East and Southern Africa has so much to offer the nature enthusiast, but the Great Kruger and Serengeti stand out among contenders. The two destinations offer very different experiences and each reflects the priorities of different travellers. The Kruger National Park in South Africa is set in a bush environment while the Serengeti in Tanzania occupies a large open plain. Depending on personal taste, you could love either… or both! The fact is that both the Kruger and the Serengeti are equally iconic, offering different ecological environments that determine them both esteemed choices. Whichever you decide to visit, the truth is that you will never tire of it, dreaming of returning again and again – each time creating new memories. Both parks – easily the size of a small country – are full of big and small game and equally demonstrates the emblematic predator-prey dynamic. They border legendary private reserves such as the Ngorongoro Conservation Area and the Masai Mara in Kenya; and Sabi Sands and Timbavati Private Game Reserve in South Africa. Both offer sightings of mystical wildlife and picturesque landscapes, family experiences, unprecedented sunsets, a touch of romance and luxury comforts in exquisite colonial-setting accommodations. 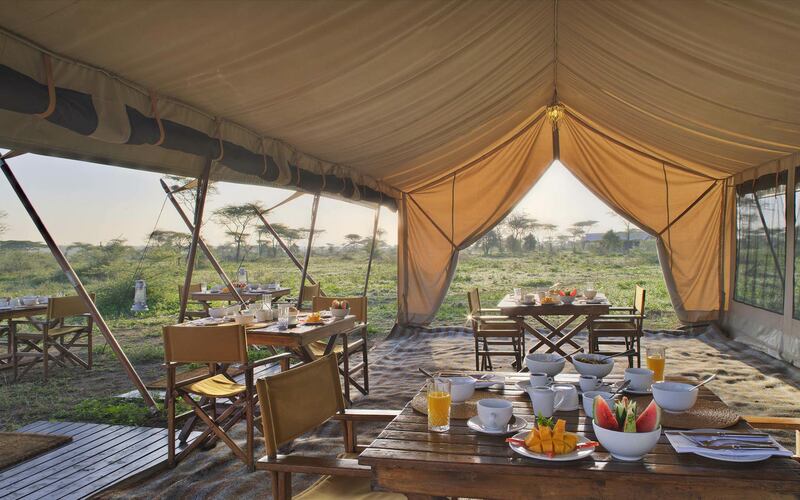 In Tanzania or South Africa you can sleep in tented accommodationsbut rest assured, it is not considered camping! Your safari will include four-poster king beds and en-suites with modern amenities. Both the Kruger and Serengeti are the perfect place to begin your African adventure, especially for those who have never been on a safari before. As a rite of passage, both parks rank among the best in the world to see the rhino, elephant, buffalo, lion and leopard. 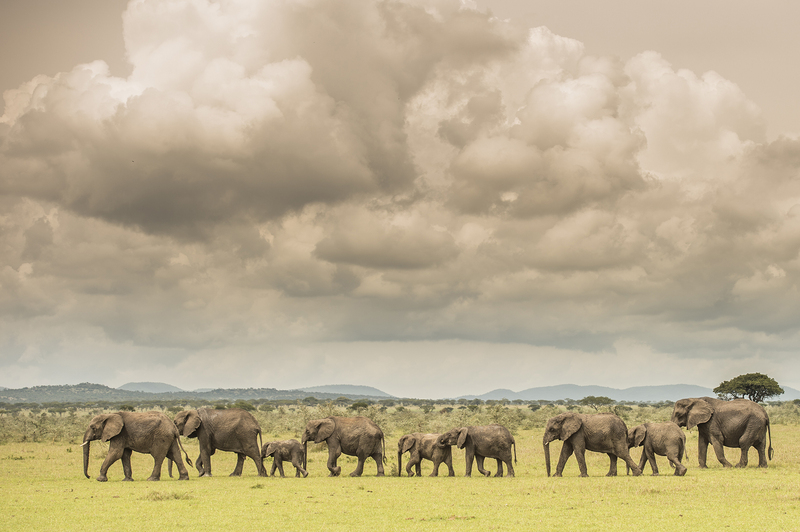 If you’re a gentle giant enthusiast, head to the Kruger that supports a dense elephant population or to the Serengeti if you’re more of a cat person. Both the Kruger and Serengeti are considered year-round destinations as it’s always a good time to go! Although, both countries have two distinct seasons and you can expect similar weather and animal patters in both countries during these times of year. The summer months bring occasional thunderstorms and higher temperatures. The landscape and vegetation is green and lush and the beauty of the landscape will overwhelm you. While large game are not as active during this period, sightings are still sensational as there are lots of young animals around and the bird watching is incredible. They each have dry winter months which are considered the best time of year for wildlife viewing. This is when the bush is less dense and animals are much easier to spot as they generally congregate near waterholes. There isn’t much rain at this time of year and the skies are blue. What sets the Serengeti apart from the Kruger during winter is the incredible wonder that is the great wildebeest migration. For most first-timers, just getting to tick off the Big Five from their bucket-list is commendable. Yet Tanzania offers travellers something greater, the annual migration of over 2 million wildebeest. And if you catch yourself in the wrong place at the wrong time, there remains an abundance of wildlife to see. Serengeti is recognised for its variety and volume of wildlife in comparison to almost every other African park. Besides the Great Migration being a manifestation of dreamlike wonder, cheetahs are frequently sighted in the south – more so than in central Kruger, and is better for locating the world’s largest antelope, the eland. Common sightings of the striking serval is best experienced (and possibly only) in the Serengeti, making it one of Africa’s top wildlife areas. Not undermining the Kruger, the park holds the world’s most important monopoly over the endangered black rhino! Contrary to the Serengeti’s eland, travellers can anticipate seeing diverse antelope on game drives such as kudu, sable, nyala and bushbuck. They also maintain one of the last endangered African wild dog populations. And while some flock to the Serengeti for the Great Migration, ecologists might be interested in the Kruger’s organised night drives to look at some of the smaller nocturnal predators. The two parks are not only located in different countries, but host different ecosystems, landscapes and wildlife. Yet they have more things in common than that which sets them apart, making it difficult to decide which to visit first. The elusive leopard can be spotted along the Seronera River and Sabi River and both parks guarantee sightings of one or all of the following: the spotted hyena, jackal, giraffe, zebra, wildebeest, hippos, crocodile and endless other wildlife.And while the black rhino is most commonly found in the Kruger, they can also be seen along the buffalo’s migration route in Tanzania. The open plains of the Serengeti promise sightings of large herds of grazers, but Kruger National Park has also recorded sightings of magnificent numbers of buffalo. Both the Kruger and Serengeti offer incredible wilderness opportunities. If you have been to the Kruger National Park or the Serengeti, which one would you recommend and why? Let us know in the comments on our Instagram page @iconicafrica and tag us in your wonderful photographs of the Kruger National Park or the Serengeti with the hashtag #KrugervsSerengeti. Kruger Park! We’ve enjoyed manybself-drives through Kruger.